Your cervical spine area is a complex construct that endures much stress and trauma from performing daily tasks. Pain in the neck is commonplace due to what this area goes through every day in the modern world. This guide will discuss neck pain, neck traction, stretching of the cervical area, and what devices are best for neck traction treatments at home. 4 What Causes Neck Pain? 7 What is Cervical Traction? How can you do neck traction at home? First, you choose the cervical traction device you need and follow the guidelines for each one. I’ve tried a bunch of these devices myself. These are the ones I evaluated as the best, based on stringent criteria such as comfort, safety, & effectiveness. Air neck traction devices are essentially neck braces. They are made up of three separate pillow units connected. You place the device around your neck and then use the hand pump to inflate it. As the pillows fill with air they straighten and relieve the weight of your head on your neck while also pushing down on your shoulders. To get a comfortable stretch for your cervical spine, you use the pump to gradually increase the air until you feel comfortable. During this stretch, your neck muscles will relax, and your cervical spine discs will realign and re-hydrate. Cervical traction also takes the pressure off pinched nerves and blood vessels. First, I’m going to recommend the top-rated air neck traction devices, then I’ll go on to other types. We have found the FDA Patented Medical Neck Cervical Traction Device by Wissmiss to be the most effective. It’s made from extremely high-quality materials and is used in medical rehabilitation centres. on the downside, it’s pricier than a lot of products out there (because it’s better). If the cost is prohibitive, then the ChiSoft Neck Traction Device comes in at a respectable second place. Although it does have some mixed reviews, it’s your best bet if you can’t afford the one above. Not every air-type cervical traction device is made of high-quality materials. It’s wise to avoid sacrificing quality for price because they can start leaking after a few uses. Sometimes, this type of neck traction can put too much pressure on your jaw, so if you suffer with TMJ, speak with your dentist and doctor before using this kind of traction. Just as the name suggests, over-the-door cervical traction devices require a sturdy door to hang on and safely use. These devices require some assembly as you must put them over the top of a door. Once the device is placed over a door, you put the halter around your chin and the back of your head. Instructions for placing the straps will be with your unit. Tighten the strap to get a comfortable stretch by pulling down on the cord or by using a heavy weighted object like water bag units. Once you figure it out, this is an excellent method of relieving neck pain & tension through traction at home. The main thing here is to go for a high quality product. The last thing you want is a cheap one that breaks whilst you’re in this position (it’s happened to me twice!). Our recommendation for the highest quality over-the-door product is the NeckPro II Over the Door Neck Traction Device. Once you have your over-the-door cervical traction system in place, it’s relatively easy to use. Make sure to properly install in over a solid and stable door. You can then sit in a comfortable chair and read or play games on your phone while it stretches your neck and relieves strain, tension, and pain. Over-the-door systems are not as portable as air neck traction devices. Unlike with the air device, this system does not allow you to lie down. You can only sit up. Make sure you tell the people you live with what you are doing because it can look dangerous. The time it takes to discover your perfect stretch to avoid putting too much traction force on your chin can be tedious. The forth of neck traction devices for using at home is the posture pump. Posture pumps are a little more expensive than the air type and the over-the-door type of traction systems, but they are well worth it, and here’s why. Posture pumps are well-built, high-quality, heavy-duty durable medical grade equipment style units. They are almost identical to those used in clinics. These devices are larger, provide better traction, and are made from high-quality materials. Even though they are larger, they often come with a carry case and are light enough to be portable. The straps and head pads are soft, comfortable, and require no assembly. You get to lie down and be comfortable with posture pump neck traction devices. You simply adjust the knobs on the base, place the strap over your forehead, and pump it up to get the desired tightness and pressure. Posture pumps are great if you’ve got the extra money to spend. In my opinion, the best posture pump is The ComforTrac Cervical Traction Kit. The ComforTrac traction kit has been around for a long time now, has great customer reviews and is made from high-quality materials that will last. This costs more than other options in this guide, but the extra money is worth it. I would love to recommend the The Saunders Cervical Traction Device. Unfortunately, it’s difficult to get ahold of this product unless you’re a medical professional or a business. The Saunders Cervical Traction Device is truly a high-quality piece of kit, but the cost is also prohibitive for some. You might be lucky and find it on eBay. Sturdier and more durable to last for years. No air pillows to leak and no door needed to support it. Comes with a carrying case to protect them and make them portable for home, office, or travel. They apply no pressure to your jaw or anywhere that pressure shouldn’t be for neck traction. While these units are lightweight and designed to be somewhat portable, they aren’t as portable as the air cervical traction devices and they take up more space. You can only use them lying down. Posture pumps cost more, but they are still good value, especially compared to medical treatments. 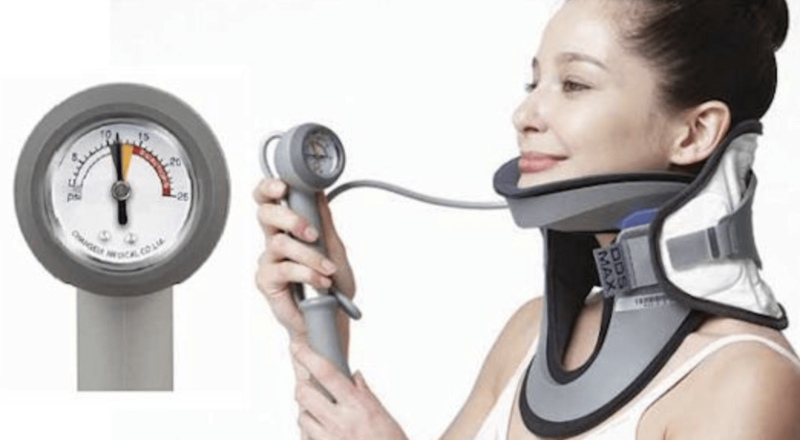 If the posture pump is something you are interested in, this Posture Neck Exercising Cervical Disc Hydrator Pump is substantially less expensive, but it is a high-quality device that relieves neck stiffness and pain. It’s affordable, easy to use, and it aids in restoring your neck curve to its proper position. It is designed to correct forward head posture, neck and upper spine posture by hydrating compressed discs and decreasing bulging discs. If you’re not comfortable with posture pumps, you may also consider buying an inversion table as an alternative. Neck Hammocks are a much newer type of product. Simply put, this device helps to relieve pressure and pain in this area by pulling the head away from the shoulders. When you do this, your muscles can begin to relax and slowly stretch, as well as any ligaments surrounding the spine. The space around your invertebrate expands which encourages circulation and blood flow. It also helps to oxygenate the tendons, muscles, nerves, and ligaments which helps to increase your levels of mobility and decrease any discomfort. If you’re suffering from pinched nerves, these will also be released. There’s only one neck hammock product I recommend. 1. Neck Hammock Device by The Neck Hammock Co. The Neck Hammock is a relatively new product with excellent reviews. Historically, patients could only receive traction therapy at the office of a physical therapist. However, these visits often take a lot of time, costly and can cause inconvenience. Today, there are many cervical traction devices that can be used in the home. In saying that, a lot of these products are bulky, cumbersome, complicated and can be expensive. What is needed to replace products like these is a convenient, comfortable, compact and affordable traction device that can help to reduce discomfort and help you avoid potentially stress-induced injuries. At the same time, you can experience the ultimate in relaxation. It is for these reasons that The Neck Hammock was created! Some users have complained about the product build quality. Not only is the neck hammock affordable and compact, but it’s convenient too – because you can take it with you wherever you go. This means that if you have a difficult workout at the gym, you can take it out of your bag afterward to bring immediate relief to your sore muscles. You can also take it to the office and use it on your neck after you’ve spent a few hours straining over your computer. When you’re flying long-haul, you’re going to be sitting in the upright position for a long time. The neck hammock is ideal post-flight to help minimize any stiffness you may be experiencing as a result. Simply place the door jamb pillow into the door jamb. It’s vital that you pull your neck hammock tight at this point, to prevent it from sliding. Once you’ve got it in place and you’re confident it won’t move, just lie down and relax. Wrap your neck hammock around the handle or knob of the door. Make sure the door is closed completely and pull your neck hammock tight. Once you’ve got it in a nice tight grip, just lie down, relax and enjoy the stretch. Using the long strap of your neck hammock, pull it through the ring of the railing. Attack the hook to the strap, so it’s firmly tucked around the railing and has no chance of slipping loose. You’d be surprised to know that there are many knock-off brands of the neck hammock. While they may be slightly cheaper, they aren’t made with the same quality, which means there’s a good chance they will break on you. The original sewn in strap version of the neck hammock has been tested and designed in the U.S., so you can trust an authentic neck hammock to do the job without breaking on you! It even comes with a six-month warranty. This is a company that believes in its products, and can confidently say that you’ll experience effective relief from pain and discomfort when using the neck hammock. It’s advisable to consult with your physician, chiropractor, or physical therapist before considering a home unit for cervical traction. You should be careful and know if it’s safe for you. Neck traction devices for home use are not recommended for anyone who has had neck surgery. Avoid overusing home cervical traction therapy regardless of the type of device you choose. You could do more harm than good to your neck by overstretching. Always follow the provided instructions with these devices and ask your chiropractor or doctor which type is best for you, how long to use it, and how many times per day to use it. Other than safety precautions, at-home cervical traction devices provide an effective and safe way to stretch your neck and relieve tension and pain, so you can relax, sleep, or go about your daily routine without discomfort. Neck pain has several causes and it can occur due to several types of disorders, diseases, and it can relate to any of the tissues in the cervical region of the spine. Note: Always check with a medical professional before using neck traction, regardless of the cause for your pain in the neck. If you don’t have the budget for a device, then self-traction with a towel could be an option. Here’s an excellent video guide. The cervical spine is the medical term for the discs in the neck. Your neck starts at the base of your skull and connects via seven vertebrae to the thoracic spine, which is the upper back. Physical therapists use cervical traction for a range of neck conditions, but you don’t need a physical therapist to safely and effectively use neck traction in the comfort of your home (you should still consult with one before using any of these products though – inappropriate use can make your neck pain worse!). The trick to doing this safely and effectively is to follow this guide to find the traction device that will most suit your neck pain needs. This guide will help you simply and easily choose your traction device and teach how to perform neck stretches via traction safely and without spending a lot of money. Cervical traction is also referred to as neck traction and is a drug-free, natural treatment that relieves neck pain. The goal of this therapy is to release the tension of your neck muscles, spread your vertebrae, and relieve pressure on pinched nerves. During cervical traction, tension is exerted by pulling your head away from your body to stretch the cervical spine and its supporting tissues, expanding the spaces between the vertebrae. Neck traction often works quickly and efficiently to relieve neck pain without medications. Faster recovery from cervical spine injuries is another benefit of traction. After traction, your cervical spine area moves back into place, which reduces the stiffness and pain you were experiencing before the therapy. Overall, cervical traction, when used properly and safely, is an effective treatment for neck soreness, stiffness, and pain. It can help improve your quality of life. I’ve used a cervical traction device at my chiropractor’s office but I’ve been thinking about getting one to use at home as well because I not always can take time off work to get my treatment. Thanks for reviewing these devices! I’ll use this as a guide when I’m shopping for one. No proof at all that these devices actually lengthen neck muscles. Good posture on the other hand, is the key to a longer appearance of a scruff, no matter how you stimulate the cervical vertebrae in the nape – only from a very young age in some African cultures is the practice of neck-lengthening a successful outcome, using copper-bands throughout adolescence as part of a (ceremonial/tribal ritual) – western cultures do not embrace these same values – why there are so many ‘Cervical Traction Devices’ to chose whilst there is a suedo-medical and beauty economy to exploit. Truly, the only way to lengthen your neck as an adult is to do tilt-manouver excercises daily and practicing body-posture techniques so that you stand (naturally) straight – will give the result of a slightly taller/leaner physiche yet not a dramatic change. Unless you are obese and lose a few kilos in weight, you will obviously have a lot less facial and neck weight – this can make anyone look way-more taller/leaner even at the nape. Those who claim that these air-pressure neck devices work, have simply become a lot more conscious and aware of their own imperfect idea of an (ideal) stature; likely spend a whole lot of time committed to all-things ‘impossible’ to radically change what the physical-self cannot, whilst working out on these physical traits that will, of course, display positive results, even if just psychologically to accentuate a better ‘self-image’. The mind is the most powerful tool of the human race and this is really the key to elongating any part of the anatomy in all honesty.